My thoughts and prayers go out to all those affected this week on the east coast by Hurricane Sandy. 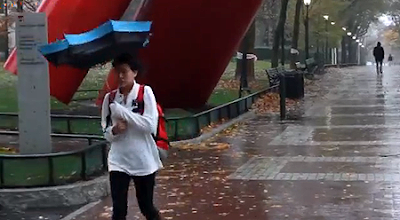 After the jump, check out this video of Hurricane Sandy hitting the Penn campus and see what some students did in the Quad to pass the time! Also, see what the windtunnel did to one girl's umbrella and check out the enormous amount of leaves I've probably ever seen at one time on Locust Walk. Remember when Hurricane Irene did this to the Penn Campus?